• Congratulations to Justin Peck for his win at Sea Otter! • AmazonSmile is a program where Amazon donates 0.5% of the purchase price of eligible products to the charitable organizations selected by Amazon customers. One or more Amazon customers have selected to support Los Gatos Bicycle Racing Club, Inc. when they shop at AmazonSmile. Simply go to Amazon through https://smile.amazon.com and choose LGBRC. Here is the direct link to LGBRC’s amazonsmile, https://smile.amazon.com/ch/77-0136355. Let's Go Shopping!! Saturday Morning Ride FB Page. 'Like' the FB to be added to the list. The ride is posted as an Event, usually on the preceeding Wednesday or Thursday. • Sunday AM Ride: Prospective Members Welcome. July, 2018 Dan DeVris book about Greg Lemond. • Need socks? We have 'Milosh' cycling socks available for purchase in size sm/med Email for details. Licensed Members who don't have accident insurance may purchase it at: www.adventureadvocates.com/usacycling/. There are three levels of coverage beginning at $20 per month. LGBRC members are expected to be active in racing or in other support roles. Attending meetings, riding with the club, helping put on our races as needed by chairing committees or volunteering for race day duties, mentoring novice riders are a few ways members take an active role in the life of our club. Introduce yourself to the club by submitting a 'bio' that asks how you got interested in cycling. The LGBRC mission is to provide a supportive bicycle racing organization for all members to achieve their personal and team cycling goals. The club will strive to promote a quality program that includes support, training, coaching and social activities. Please click to read our goals in detail. The Los Gatos Bicycle Racing Club began in 1960 when Bob Tetzlaff and Jack Hartman returned to Los Gatos following the Rome Olympics and three years in the U.S. Army. Together they organized the club featuring a series of training races for junior riders, including Greg Lemond. 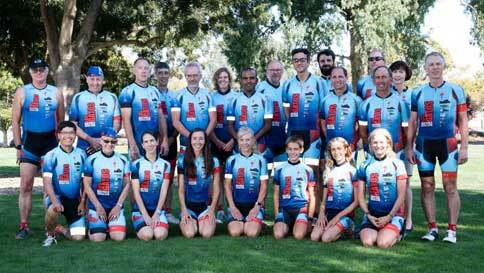 The Los Gatos Bike Club evolved into the development club the LGBRC is today.